Panoramic images of the wider landscape and waterscapes encountered in the natural world and elements within these genres of mans work such as castles etc. Photographed on the Wednesday 03 September 2014. 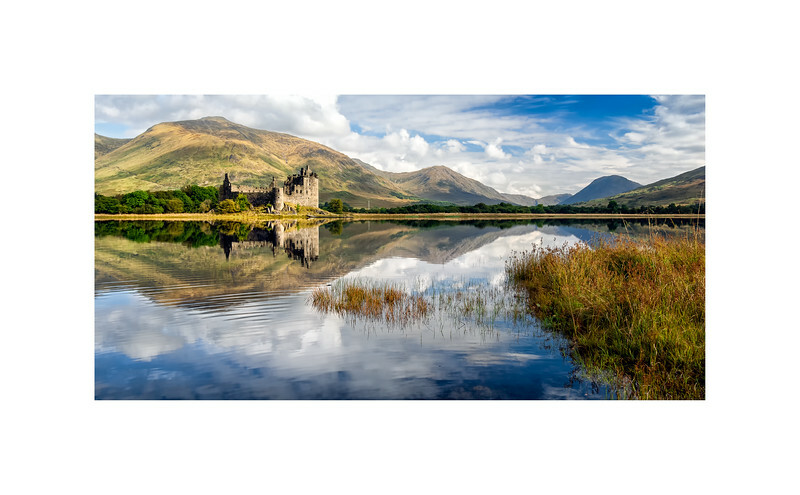 Kilchurn castle is at the NE end of loch Awe the longest fresh water loch in Scotland, this was an important location in medieval Scotland - such waterways were the highways of the day facilitating movement through the otherwise remote and inaccessible terrain of Argyll. It can be accessed on foot from Dalmally road on the A85. This image was taken from the opposite bank which can be accessed form a layby on the A819 at about 10.30 in the morning. Kilchurn Castle was built on ‘Elankylquhurne’ (island of Kilchurn) by Sir Colin Campbell, 1st Lord of Glenorchy before his death in 1475 (also known as 'Black Colin of Rome' on account of his foreign travels). He was the second son of Duncan Campbell, Lord Campbell, and had been granted Glenorchy in 1432 by James I. Kilchurn Castle remained their family’s powerbase for 150 years and not abandoned until the 1700s. The castle comprised a five-storey tower-house at one corner of an irregular-shaped courtyard. The tower house still stands substantially complete, overshadowing the rest of the complex. On the ground level of the tower were a cellar and prison. There was a hall on the first floor and private chambers above. Colin’s son, Duncan, the 2nd Lord, added the laich (lower) hall in the courtyard before his death at the Battle of Flodden in 1513. The 3rd and 4th Lords both died at Kilchurn, in 1523 and 1536 respectively. Colin, the 6th Lord, added the four fine angle-turrets on the top of the tower house. However, he was also responsible for relocating the Campbells of Glenorchy to their new home – Balloch (now Taymouth), in Perthshire – before his death in 1583. Thereafter Kilchurn played second fiddle to the family’s Perthshire residences. During the troubled times of the late 1600s, following the overthrow of the Stuart dynasty in 1689, Kilchurn found a new role. In that year Sir John Campbell of Glenorchy, 1st Earl of Breadalbane, retired to his ancestral seat. He set about converting it into a garrison stronghold, a project which took the best part of a decade. The old tower house was converted into accommodation for the officers commanding a garrison of 200 men. For that garrison, a purpose-built barracks was erected along the north side of the courtyard. The barrack block still stands relatively complete, and is the oldest surviving barracks on the British mainland. Little use was made of the garrison stronghold, other than as an outpost for government soldiers during the Jacobite rebellions of 1715 and 1745. By the 1750s the garrison had been withdrawn from Kilchurn and it started to suffer from neglect. The deterioration was hastened considerably when the roof was destroyed by a lightning strike at some point before 1769 and slowly deteriorated into its current state. Later, in the nineteenth century, improvements to drainage saw the water level of Loch Awe drop connecting Kilchurn to the mainland for the first time in its history. Today its photogenic setting makes it a favourite stop for tourists.